The meeting, co-chaired by Mr. Sumith Nakandala, Additional Secretary of the Ministry of Foreign Affairs of Sri Lanka and Hon. Enrique A. Manalo, Undersecretary for Policy of the Department of Foreign Affairs (DFA) of Philippines,discussed ways to deepen and broaden Philippines-Sri Lanka relations in the areas of trade and investment, defense, education, tourism, labour migration, agriculture, and mutual legal assistance. New areas of cooperation were also explored during the Consultations, including training for health service providers in disaster response, technical cooperation in nursing, and possible sister-city agreements between local government units. Both sides also exchanged views on regional developments in Asia, as well as in ASEAN-related topics, including ASEAN-Sri Lanka relations and Sri Lanka’s desire to become a Sectoral Dialogue Partner (SDP), the highlights and accomplishments of the Philippines’ 2017 ASEAN Chairmanship, and the forthcoming 33rd ASEAN Summit. The Philippine delegation included DFA Assistant Secretary for Asian and Pacific Affairs (ASPAC) Mr. Meynardo L.B. Montealegre, Philippine Non-Resident Ambassador to Sri Lanka Mr. Vicente Vivencio T. Bandillo, ASPAC Executive Director Mr. Josel F. Ignacio, DFA Economic Diplomacy Unit Director Mr. Edgar Tomas Auxilian, DFA Office of the Undersecretary for Policy Special Assistant Ms. Lily Ann Cheng, ASPAC Principal Assistant Mr. Ralph Jacob Viloria, DFA Office of Maritime and Ocean Affairs Principal Assistant Ms. Rowena Mutia, Department of Trade and Industry Director Atty. Ann Claire C. Cabochan, Department of Health Director Ms. Gloria J. Balboa, Philippine Overseas Employment Administration Director Ms. Laura S. Timonera, Department of the Interior and Local Government Director Atty. Odilon L. Pasaraba, and Department of Justice State Counsel Ms. Florina C. Agtarap. 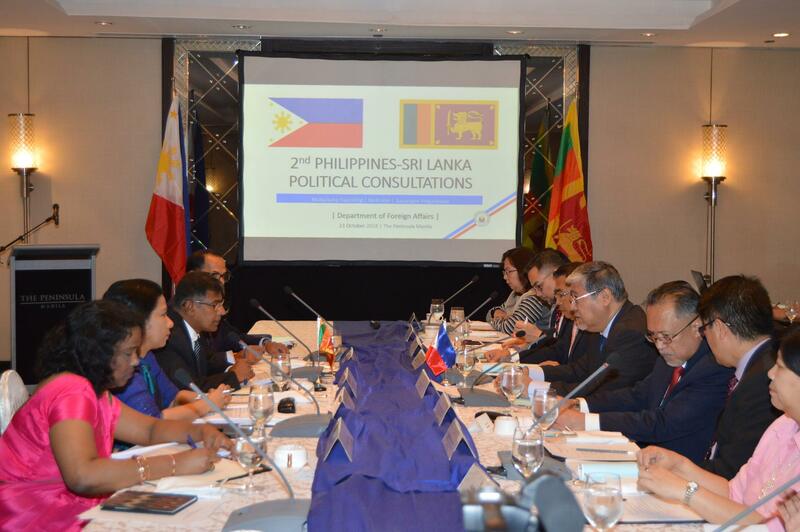 The Sri Lankan delegation included Sri Lankan Ambassador to the Philippines Mrs. Aruni Ranaraja, Director for East Asia & Pacific Affairs of the Ministry of Foreign Affairs of Sri Lanka Mr. K.K. Yoganaadan, and Second Secretary of the Embassy of Sri Lanka Mrs. Sewwandi De Silva. 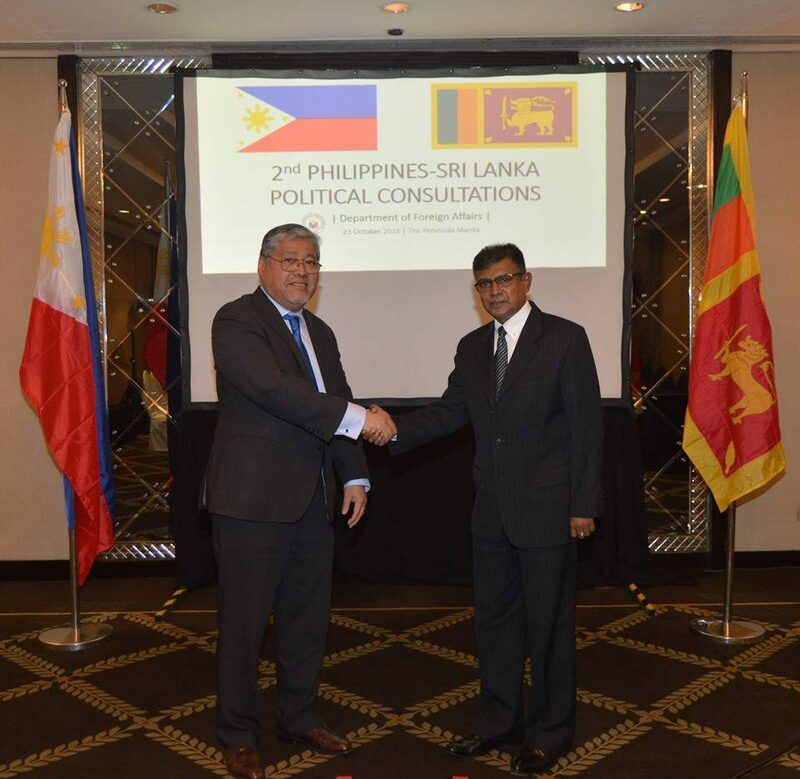 Sri Lanka and the Philippines launched the Political Consultations mechanism on 21 November 2016 in Colombo, Sri Lanka. The second meeting in Manila comes as Sri Lanka and Philippines look forward to celebrate the 58 years of formal diplomatic relations on 11 January 2019, with high-level visits and other commemorative activities. The next round of Political Consultations will be held in Sri Lanka, with the exact date to be determined and mutually agreed upon through diplomatic channels.